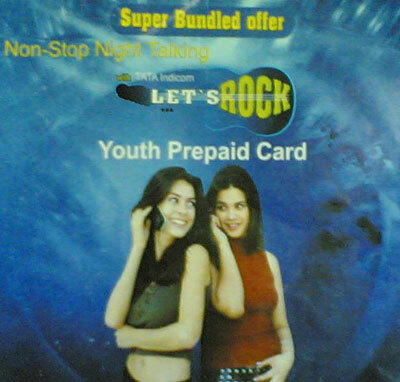 Tata Indicom has launched a new prepaid scheme, which would cater to the youth. Quite evident by the name, it is an attempt to rope in teenagers just the same way Idea is trying with its “Mera wala Gang”. The tariffs are determined keeping the target market in mind and enticing them to move to Tata network. Yup, this scheme is only for the new customers. Students wanting to avail the benefit of this scheme would have to show his Identity Card at the service center. The card costs you Rs. 201 as an initial amount, which would be valid for a period of 3 months and would offer a talktime of Rs. 30. The call charges are as follows. The scheme offers free calling to all Tata Indicom users from 10 pm to 8 am, which Tata considers as its USP. Through this concept the service provider would try to pull in groups who would for some reason want to talk to each other at night. The rest of the time, you could talk to other Tata users @ 30 paise and other users at 50 paise. On further enquiry, the executive said that the charges during the night are Rs. 1.5 and during the day the charges reduce to 99 paise which we think is an error and should be the other way round. As far as STD rates are concerned, calls to Tata cost Rs.1.2 during the night and for the rest of the time calls cost 99 paise. Cost to other users during the night and the day are Rs. 1.99 and Rs. 1.2 respectively. Roaming local outgoing rates are Rs. 1.4 and roaming STD outgoing Rs. 2.40. Incoming calls while roaming are Rs. 1.75. The card also offers Internet service @ Rs. 2 per MB. According to us, the rates of the scheme are attractive and may pull in some customers, but since the USP of the scheme rests on availability of your friends using Tata Indicom, the scheme may not be such a hit among the target market. Also since the CDMA arena is limited when it comes to handset offering, GSM has an upper edge here as youths prefer to change their phones frequently.